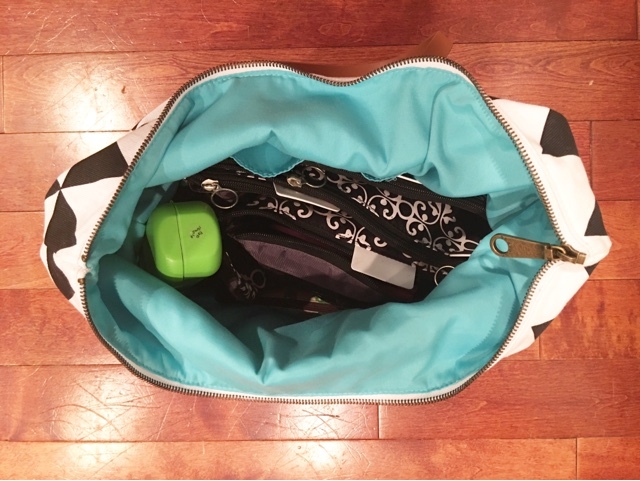 As a mom of three, I am always on the hunt for a bag that will accommodate all the things. I get pretty tired of going between a diaper bag, purse, gym bag, etc. I can't even begin to explain how many bags I have gone through in the last five years. Cross body, backpack (which I LOVE by the way, but driving a minivan is enough torture). So when I came across Swim Outlet's holiday gift guide I got sucked into the never ending amount of products they offer! And I also knew I was about to research the crap out of all the bags they offered. I stumbled upon this Seafolly bag and I knew I had to have it. Black and white is an obsession of mine lately (with a little gold thrown in there? I would do it to my whole house if I could!) so I gladly added it to my cart and patiently waited.